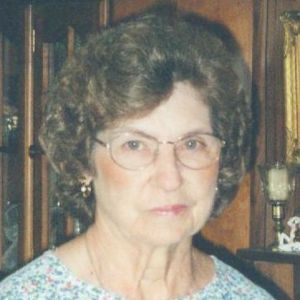 Mrs. Martha Ellen Johnson Faircloth, age 78, of Dunn, died Monday, April 16, 2012 at E. Carlton Powell Hospice Center in Lillington after a battle with Dementia and a stroke. Mrs. Faircloth was born October 12, 1933 in Johnston County to the late Delma & Amanda Johnson of Benson. She was preceded in death by her husband, James Leon Faircloth. She was a member of Benson First Assembly of God Church of Benson. She worked at several of the sewing plants in Harnett & Johnston Counties. Funeral Services will be held Thursday, April 19, 2012 at 2:00PM at the Cromartie-Miller & Lee Funeral Home Chapel in Dunn, with Rev. David Hughes officiating. Burial will follow in Devotional Gardens. The family will receive friends Thursday, April 19, 2012 from 1:00PM to 2:00PM at Cromartie-Miller & Lee Funerals and Cremations in Dunn. Friends and family will be at the home of Wanda & Stacy Hudson's, 1395 West Core Rd. on Wednesday April 18, 2012. The beautiful and interactive Eternal Tribute tells Martha Ellen 's life story the way it deserves to be told in words, pictures and video. Our thoughts and prayers are with your family. May God give you the strength to endure the days ahead and Bless you. All is well with your Mom. Love you.